Born: August 29, 1801 in Sandwich Ma. Died: May 3, 1880 in Sandwich Ma. in his 79th yr.
1. Vaodica Swift; (1827 – March 1, 1830); Vaodica died at 3 yrs, 18 d. & is buried in Cataumet Cemetery. 2. Philander Russell Swift; (January 12, 1829 – June 17, 1905); Married (1) Cornelia Frances Bourne (1827 – 1876) (John Bourne & Martha Swift) in Falmouth Ma. on August 31, 1857 & married (2) Ann Maria (Tuckwell) Nye (George Tuckwell & Ann M. Colesworthy) in New Bedford Ma. on February 14, 1882; Ann married (1) Silas Fish Nye (1832 – 1874) (Franklin Nye & Rebecca N. Fish) in New Bedford Ma. on September 14, 1871; Philander is buried in Oak Grove Cemetery in New Bedford Ma..
3. William Hinds Swift; (February 1, 1831 – August 1918); Married Roxalena Cunningham Trask (1834 – 1905) (William C. Trask & Mary Fowler) in Lynn Ma. 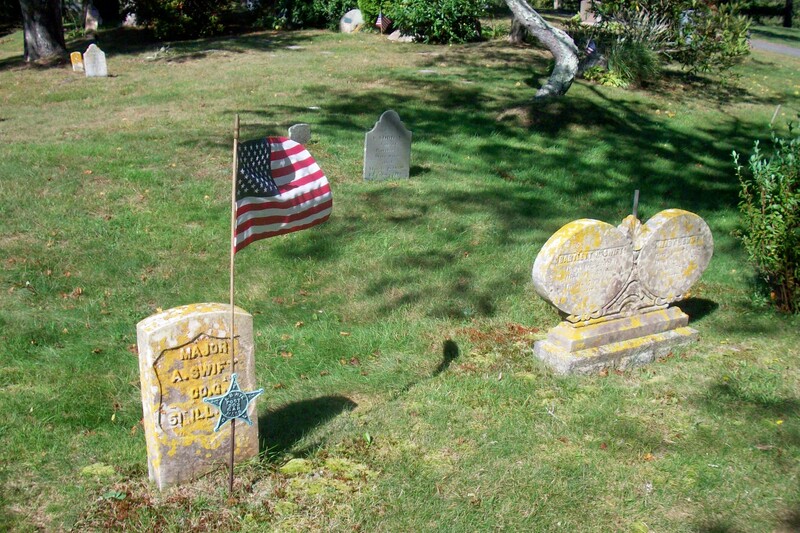 on August 7, 1853; William was a ship carpenter; He & Roxalena are buried in Pine Grove Cemetery in Lynn Ma..
4. 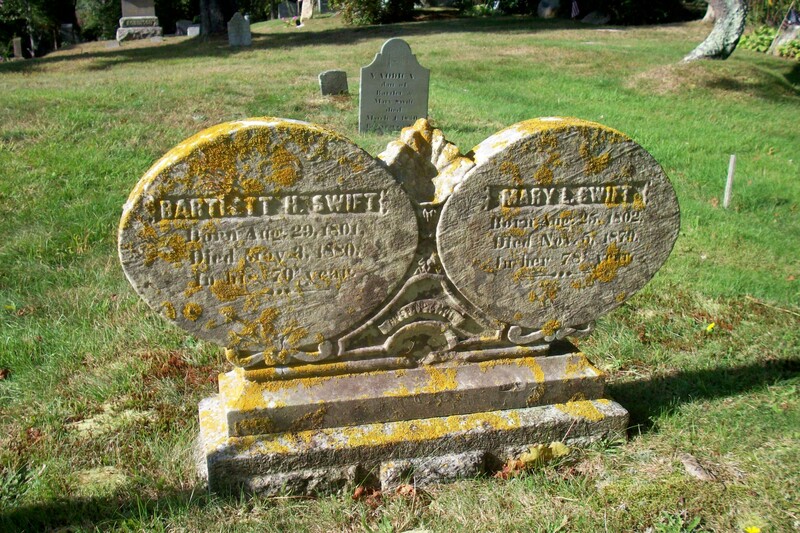 Elmina/Almira C. Swift Swift; (November 26, 1835 – May 6, 1893); Married Ezra W. Swift (1831 – 1910) (Ezra Swift & Ruth Ellis) in Sandwich Ma. on July 18, 1858; Ezra W. is buried in Cedarville Cemetery in Plymouth Ma..
5. Benjamin E. Swift; (March 1, 1834 – May 14, 1896); Married Melora Ann Linnell (1836 – 1926) (Prentice Baxter Linnell & Polly Webber) in Barnstable Ma. on September 6, 1854; They had 11 children; Benjamin & Melora are buried in Cataumet Cemetery. 6. Major Allen Swift, Civil War; (June 3, 1839 – November 2, 1900); Major, a soldier, died at 61 yrs, 5 mos. ; He was unmarried & is buried in Cataumet Cemetery.